The construction industry has many opportunities for RFID system deployment. Due to myriad of construction parts and equipment on-site, in laydown yards and storage buildings, inventory control and asset tracking using RFID technology significantly increases efficiency of operations. Another issue in construction environment is personnel safety, which is especially challenging in heavy industrial and explosive environments (such as oil and gas facilities). RFID4U has developed an Emergency Management and Mustering System (EMS) using RFID technology and TAGMATIKS, our cutting-edge enterprise, cloud-ready sensory adaptive network software platform, that enables rapid deployment and integration of scalable, real-time visibility solutions. The system provides real time visibility tools, analytics and dashboards, that are available for smartphones and tablets for making time-critical decisions on the road. We support all Android, iOS and WM 8 mobile devices. In the EMS system, all readers report data to a centralized server that provides real-time reports on personnel movement within mapped areas and issues alerts in case of emergency. The system has to deliver an automatic headcount and each worker’s location at any time. It also has to provide an option for manual updates through the mustering station handhelds or PDAs if the server were to go offline and automatic updates sent to the server, when it comes online. RFID system will deliver information on whereabouts of employees, guests, suppliers and customers within the facility and will automatically determine if these persons safely arrived in the designated assembly areas, or remain within the evacuation zones. System provides reports and alerts, that are delivered to the central monitoring station as well as to appropriate personnel on their mobile devices. Automatic alerts and situation reports can be also sent to emergency response teams who learn valuable information about the scene before they arrive. RFID system uses RFID personnel tags that are issued to all employees and visitors entering the facility. These are usually in form of a key fob or a badge and some can also include a slot to insert a visual identification card. RFID readers and antennas are strategically placed within the facility. The placement is important and it is usually around key building assembly areas and ingress and egress points. The density of RFID read points depends on the technology. Active RFID system will have longer read ranges and better penetration. Passive RFID system will require higher density of readers, which will be mostly deployed around entrances and exits, as well as passages between locations, in order to track passerby personnel. Handheld readers or PDAs will be deployed at security checkpoints and at mustering stations. All hardware has to be rugged and protected from the harsh environments that are often present. It has to survive potential damage from dirt, salt water, corrosives and physical abuse; therefore, fixed readers are often deployed in specialized NEMA enclosures that protect them. 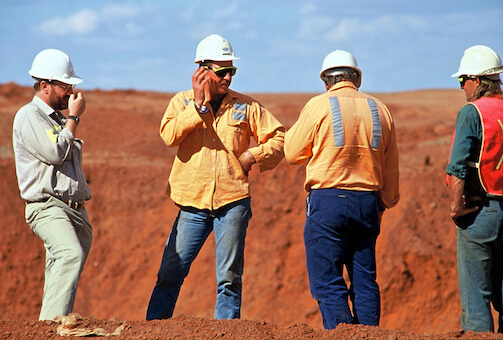 Handhelds and PDAs also have to meet the requirements for ruggedness. In some cases, system also has to be intrinsically safe, when deployed in explosive environments (oil platforms, etc. ).